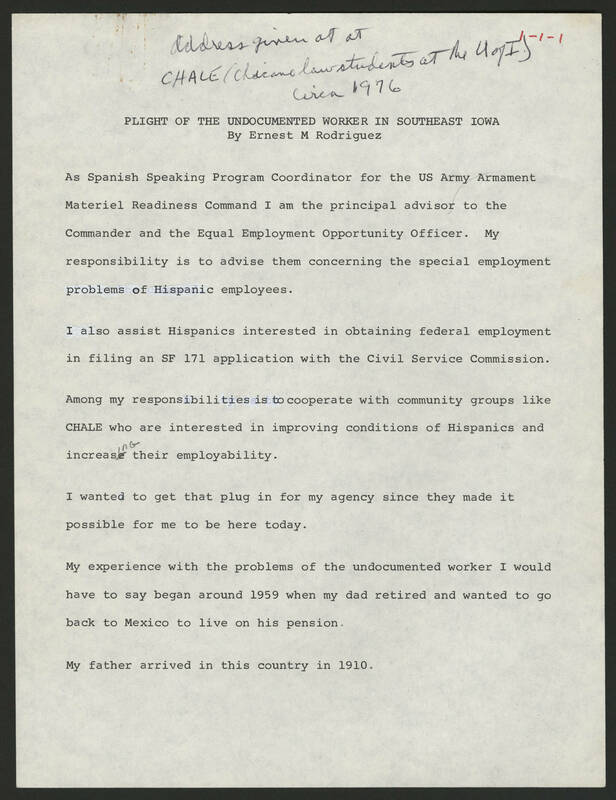 Address given at at CHALE (Chicano law student at the U of I) 1-1-1 Circa 1976 PLIGHT OF THE UNDOCUMENTED WORKER IN SOUTHEAST IOWA By Ernest M Rodriguez As Spanish Speaking Program Coordinator for the Us Army Armament Materiel Readiness Command I am the principal advisor to the Commander and the Equal Employment Opportunity Office. My responsibility is to advise them concerning the special employment problems of Hispanic employees. I also assist Hispanics interested in obtaining federal employment in filing an SF 171 application with the Civil Service Commission. Among my responsibilities is to cooperate with community groups like CHALE who are interested in improving conditions of Hispanics and increasing their employability. I wanted to get that plug in for my agency since they made it possible for me to be here today. My experience with the problems of the undocumented worker I would have to say began around 1959 when my dad retired and wanted to go back to Mexico and live on his pension. My father arrived in the country in 1910.